The Freedom From Religion Foundation is sending up a warning flare regarding a Christian event scheduled for Wednesday in a Texas school district. A concerned district community member contacted FFRF to report that a teacher at North Pointe Elementary in the Clear Creek Independent School District is currently coordinating a prayer event on the school’s campus, with her husband (a Baptist pastor), set for Wednesday, Sept. 26. The teacher’s advertisement for this event describes it as being led by an adult and states that parents are encouraged to attend with their children. Several members of the school’s PTO and other adults have reportedly pledged to participate, as well. District staff must cease organizing or advertising religious events for students, Grover writes to Clear Creek ISD Superintendent Greg Smith. If the district allows adults, particularly staff employees, to hold a private religious event on district property at the start of the school day as students arrive, it creates the appearance that the district endorses the event’s religious message — in this case an exclusively Christian message, FFRF emphasizes. This is unlawful and coercive, and additionally will alienate those community members whose religious beliefs are inconsistent with the message being promoted by the event, including the over 43 percent of Millennials and younger Americans — the demographic of the district’s students and many of their parents — who are non-Christian. 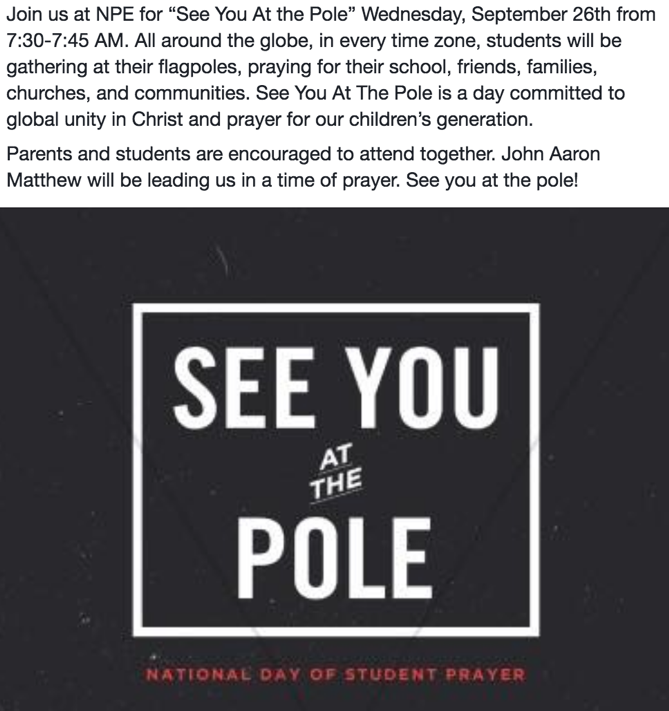 See You at the Pole™ is a student-led event. Strong student leadership is crucial. Adult volunteers and parents should not lead the See You at the Pole™ gathering. Many well-meaning adults take over and take away from the students by trying to lead out in the prayers at the flagpole. This is not the intention for See You at the Pole™, nor is it legal for adults to lead. Please step back or stay away and let the students grow and learn in their faith by leading. FFRF asks that the Clear Creek Independent School District ensure that school representatives or outside adults are not organizing, advertising or participating in any such events on campus, urging the school district to remind its staff members that their constitutional obligations as government employees prohibit such conduct. FFRF warns all public schools that teachers must not interfere or participate in student-initiated prayer events on campus. Any student or parent who observes direct school involvement in a See You at the Pole event this Wednesday is encouraged to contact FFRF. The Freedom From Religion Foundation is a national nonprofit organization with the purposes to protect the constitutional separation between state and church, and to educate the public on matters related to nontheism. It currently has more than 32,000 members throughout the country, including over 1,300 in Texas.